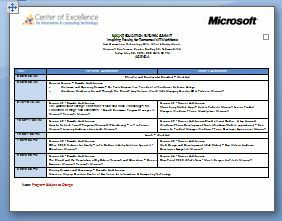 The Cloud and the Revolution of Big Data in Research and Education: Dr. Dennis Gannon’s, director, eXtreme Computing Group, Microsoft Research, presentation was one the most widely appreciated presentations at the IT Futures Summit @ Microsoft on 5.20.11. Educate yourself on what Microsoft’s research focuses on. Enjoy! Office 2010 Features for Faculty: John DuBois, Industry Solutions Manager – Education, Microsoft presentation explores the new features of Office 2010 and how to use them (both as a user and an educators). How to Refresh Your IT Program (Microsoft IT Academy): Jeff Johnson, Microsoft Learning Academic Area Lead, Microsoft presentation showcases the many benefits of how the MS IT Academy can bolster your IT program.